Here's a litte of my latest piece for MASNSports.com. Parts of the last two seasons have been nothing short of rough for Nolan Reimold. Because the Orioles are the WORST on the WEST COAST! AH HAAAAAAAAAaaaaa. Yeah. I think the Baltimore heat is beginning to melt my brain, the Orioles' lousy play over the long weekend certainly didn't help matters. The Orioles followed up their feel-good four game winning streak with an equally abysmal four-game losing streak. 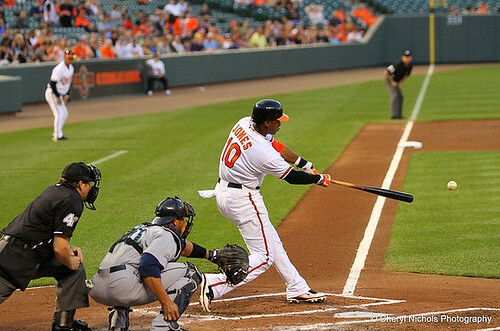 The Orioles were swept out of Oakland and dropped game four yesterday to the Seattle Mariners. Doug, If I see one more attempt at sly crude humor about his name I am going to scream, Fister made the O's look silly yesterday pitching into the eighth inning and recording a season high nine strikeouts. It seemed as if he was ahead on every better and the Orioles were stymied for the fourth straight day. Jake Arrieta , trying to play stopper, had some rough luck in this game. He gave up two quick runs in the first but settled down for a strong second inning. In the third inning the wheels came off. Ichiro led off with a sharp single that deflected off of Arrieta's shin. After a visit from the trainers and manager Showalter Arrieta tried to tough it out. he gave up a seeing-eye single to Ryan and walked Smaok to load the bases. After getting a fly out he walked the next to batters and obviously had lost it. Simon came on to finish out the inning and provide some solid relief but the damage was done. The Orioles were down 4-1 by the end of the third and that is all the Mariners would need. There were a couple highlights though. Mark Reynolds seems to be figuring it out, finally. He hit a monstrous upper-deck shot in the third to cut the lead to 2-1 at the time. The Orioles bullpen did a great job pitching 5.2 innings of scoreless relief to at least keep the Orioles in it long enough to mount a rally in the eighth.But it was all for naught. The Orioles now sit four games under the .500 mark to which they fought so hard to get back. With two games left on this west coast swing they simply need to find a way to win the next two games. Coming home two games under .500 will feel a lot better than four or six games under .500. Once again, an Oriole pitcher struggled and was inconsistent; therefore, the offense had to dig out themsleves of a hole for a chance to win. They could not. The Orioles lost to Seattle this afternoon, 4-3 , to start off their three-game series . They have now lost four in a row. Baltimore’s Arrieta struggled on the mound and lasted only 2 1/3 innings on Sunday . He gave up two runs in the first and second innings, which was enough for Seattle . The Orioles came within a run of tying the game as they scored two runs with a Nick Markakis and off an error from Mariners' third-baseman Chone Figgins in the eighth inning. Baltimore has another golden chance to perhaps tie the game at the very end. They had a runner on base in the ninth inning off reliever Brandon League; however, Robert Andino grounded into a double play to end the game. Mark Reynolds would homer in the third inning. Once again, the offense suffered with men in scoring position, as they were 1-for-10. The Mariners’ Doug Fister got the win on the mound . As it is, the Orioles are defeating teams they need to; however, they have problems with some of the better teams and staffs with outstanding pitching – which Seattle and Oakland match the criteria. 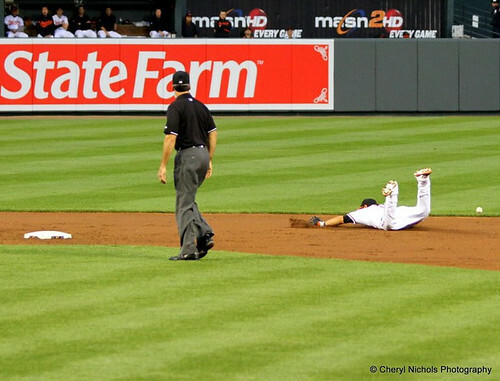 In addition, Adam Jones did not start today, but came in as a pinch-runner (for Vladmire Guerrero). If there were positives out of today’s game, Felix Pie had two hits, pitcher Alfredo Simon threw 3 2/3 scoreless innings to keep Baltimore in the game and Pedro Viola did not give up a run in 1 2/3. After today’s loss, the Orioles have fallen to 24-28 on the season. The Orioles have improved markedly from last season; however, they are one streaky team. The Orioles could not salvage their three game series in Oakland, as they were swept over the weekend. They are 24-27 and have lost three in a row after a five game winning streak to start their West Coast road trip. 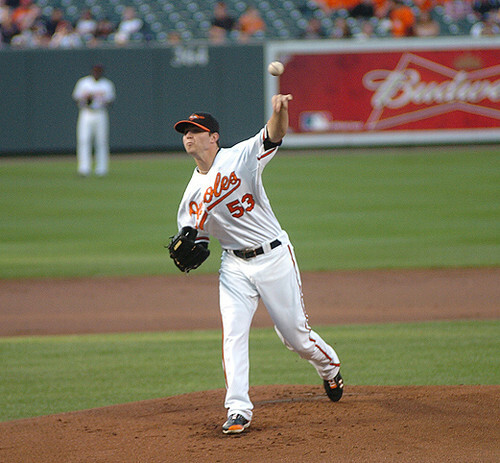 The Orioles lost 6-4 to the Athletics as starting pitcher Zach Britton could not play the role of stopper. Britton’s been by far the best pitcher on the Orioles since the season began; however, the A’s offense tagged him for four runs in the fifth inning thanks to a Josh Willingham three-run homer, blowing a 4-1 lead. He is now 5-3 for the year. Baltimore got all their offense in the fifth inning as they jumped all over Oakland starter Guillermo Moscoso (who won the game) for four runs. They could not score any runs more after that as Oakland’s bullpen once again kept Baltimore at bay. J.J. Hardy had two hits and four Orioles drove in runs. Nothing good ever happens on the West Coast. The Orioles first west coast swing, at least two series in the pacific time zone, started last night in Oakland. Oakland is an infuriating team simply because they really should not give us as much trouble as they do. Shocking, the Orioles have not had a winning record against the Athletics since 1998! I have no idea what it is about the west coast swing but that first trip out there usually spells doom for the Birds. In each of the last 10 years the Orioles have left the east coast with one record, played at least six games in California or Seattle and left with a worse record. Often times the Orioles were right around 500 and the west coast swing horror show would sink the team for what seemed like the rest of the season. Last night the Orioles got off to their scripted west coast start against those pesky pesky A's. The Oakland Athletics, keepers of the secrets of money ball and apparently a magical well from which pitchers of no less than above league average spring from. Last night the Orioles took on one such pitcher Gio Gonzalez. Gonzlaez is off to a solid start this year though last night he looked a bit shaky walking five orioles in five innings and hitting Vlad Guerrero but he also struck out seven. The Orioles certainly had their opportunities during Gonzalez' start but they were unable to to get that key hit they had been finding this past week. Guerrero, Hardy, Fox and Reynolds all hit into double plays and the Orioles would go 0-7 with runners in scoring position. The two runs the Orioles did score in the 6-2 loss came on a bases loaded walk to Mark Reynolds and an unearned run that came when Gonzalez fell trying to cover first on an Adam Jones grounder that would have easily been another double play. It’s been a very good week for the Orioles and on a very hot Thursday afternoon, they completed a three-game sweep of the Royals, defeating them 6-5, as Vladmir Guerrero delivered a game-winning RBI-single in the bottom of the 12th inning. The Baltimore Orioles are now at .500 with a record of 24-24. I think it’s been a while since the Orioles have been at that mark this late in the season for a good, long while, which is pretty astounding to think about. 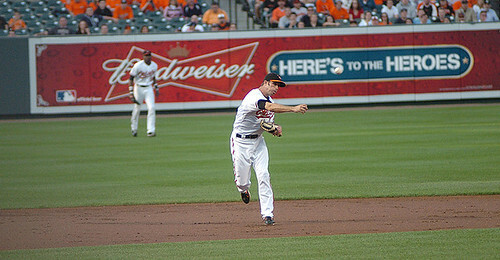 Nolan Reimold had a huge game and delivered much of the offense for the Orioles, going 4-for-4 with four runs driven in. Considering Reimold’s seemingly long road back to the majors after injury, personal issues and whatever else, it’s good to see that he’s still with the team and given a chance to play. Who knows what the future holds with him, but it is good to see that the Orioles didn’t consider him to be an after-thought. Jeremy Guthrie was so-so on the day, as he went seven innings and gave up five runs – four earned. The Royals exploded for four runs in the second inning; however, Guthrie settled down and pitched well enough after that to give his team an opportunity to win. The bullpen held the game in check and Jeremy Accardo got the win. Of course, naturally, Kevin Gregg made things interesting as he came up in the tenth inning and loaded the bases, but got a critical fly-out to end the frame. With the Birds flying high, they are now only 3 games back from the American League East divisional lead. Starting today, they embark on a six-game road trip where they’ll face the Oakland Athletics and Seattle Mariners. Saturday was a good one for the Orioles as they closed out a bad week, defeating the Washington Nationals, 8-3. They snapped a painful four game losing streak and exorcised an embarrassing loss to the Nationals on Friday night. Hard-luck starter Jeremy Guthrie finally got the run support he needed and sailed to an easy victory . He went seven innings and gave up two runs – all unearned. The runs came courtesy of a Brandon Snyder error in the third inning. The offense came together scoring four runs in the third and seventh innings. 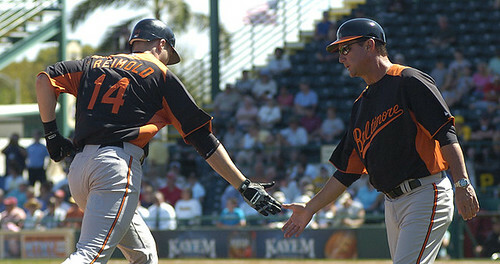 Nolan Reimold – who was recalled from the minors on Friday – hit a two-run homer and five Orioles drove in a run each. 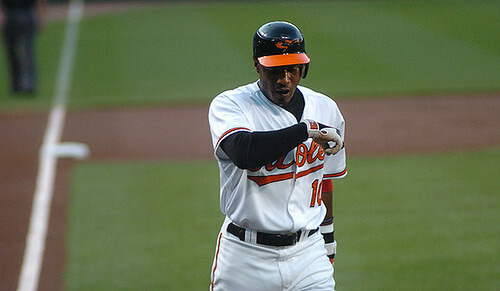 Four Orioles – Adam Jones, Nick Markakis, Vladmir Guerrero and Matt Wieters – each had two hits. John Lannan for Washington took the loss on Saturday. 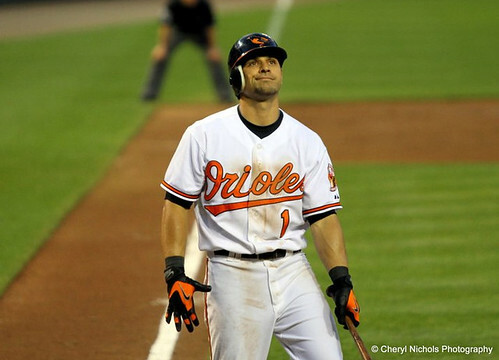 A good win overall by the Orioles, but they could have more bad news potentially with Brian Roberts. At the moment, he is on the seven-day disabled list with concussion symptoms. According to various reports, Roberts has not resumed physical activity for baseball and may not be ready to play as he is due to come off the disabled list on Tuesday. Sadly, Roberts notes that he has headaches and is not sure when he’ll play again. For the past two seasons, it seems that he’s had health issues and can’t stay on the field. It's like there's one thing -- or another keeping him off the field. The Orioles really need what Roberts brings to table – nothing against Robert Andino or Felix Pie – but the offense lacks the intangibles that make him one of the better leadoff men in the game. The Orioles have had a bad week. An embarrassing week. The type of week that makes you question your ability to keep going with this team. After two heartbreaking losses in late innings against the Red Sox and Yankees the Orioles were then on the receiving end of two back-to-back colossal raw shellackings at the hands of the Yankees and Nationals. The Orioles have given up 10 or more runs four times this year. To give you an idea how much those four games have had an impact on their overall stats, consider this. Currently, according to Baseball Reference, the Orioles are allowing just over five runs a game. In all other games outside of the four 10+ games the Orioles are giving up four runs a game. Those four games account for slightly more than 25% of all the runs that the team has given up all year. So I guess it hasn't been all that bad. 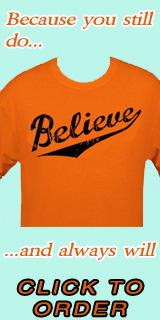 Another salve for a weary Orioles fan, if you want to call it this. The Orioles once again can't solve the impossible Yankees. So far the Birds are 0-6 against the New Yorkers, meanwhile they are two games over .500 against the rest of baseball. They have found varied and creative ways to lose to the Yankees so far this year. Bullpen meltdowns, extra-inning thrillers, good old fashion trouncing. The bloated zombified corpse of Bartolo Colon has been resurrected through some dark, ancient ritual and is pitching well. The same dark magic has allowed Curtis Granderson to discover those short porches in Yankee Stadium International Airport and he only needs nine more to match his total from all of last year. Brian Roberts has a concussion, Derrek Lee has a strained oblique, Berken and Gonzalez have been awful, Bergy got destroyed and Tillman has a tender back. Yikes. Friday Night Was All Kinds of Ugly for the Orioles. If you thought what happened on Thursday night when the Orioles played the New York Yankees, Friday's game against the Nationals was even worse. I don't know how to quite articulate what I saw on Friday, but I will try -- very quickly. In one of the worst losses I've seen at Camden Yards in a very long time , the Baltimore Orioles got manhandled by the Washington Nationals, 17-5. You all know what happened. It was just incredibly frustrating as a fan to watch. Not to disparage the Nationals; however, you would expect this kind of thrashing from the Yankees or Red Sox -- not a team that is pretty much at the bottom of every offensive stat in the sport of baseball. The Nationals broke a franchise record for the most runs scored in a ball game since they moved from Montreal. In addition, they scored *more* runs on Friday than they had done in nearly a week. Crazy. 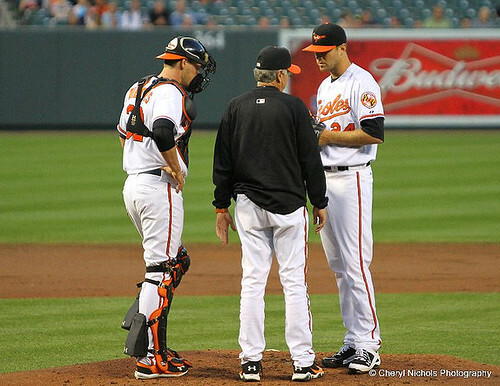 It was not a good night for the Orioles, especially for Brad Bergesen. We all know that the Yankees are always tough, but on Thursday they were brutal. 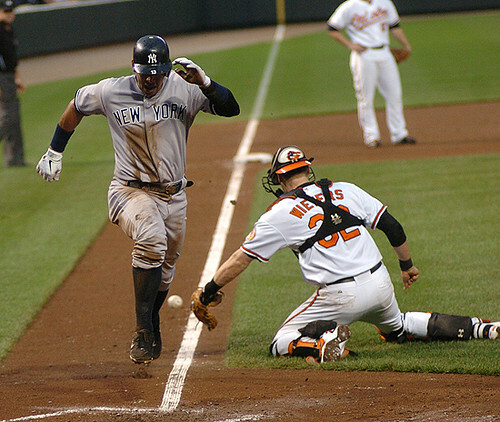 The record will show that the Baltimore Orioles got trashed by the New York Yankees, 13-2 , over the course of nine innings; however, the game was over before it even began. Baltimore is now 19-23 on the season and New York swept the brief two game series. They have now lost three in a row. The Yankees who had trouble scoring on Wednesday, just had their way with Oriole pitching on Thursday. Bergesen gave up five runs in a horrific first inning and the New York Yankees didn’t look back from there. His command was off, he could not hit his spots throughout his outing and the Bronx Bombers made him pay. New York held a 5-0 lead even before the Baltimore got its first batter up. Everyone in attendance knew it would have taken a miracle for the Birds to even be a factor on the night. The miracle never came. In fact, throughout the game you knew it was going to be downright horrible. 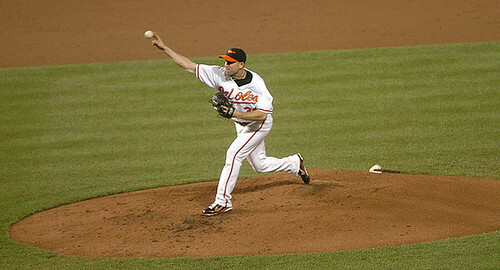 Things only got worse for the Orioles as Bergesen was taken out and Chris Jakubauskas was brought in the fifth inning. Jakubauskas would serve up a monster homer to Mark Teixiera in the frame. New York built up a 9-0 lead by the bottom of the fourth, kept bringing on the pain and never looked back. All things considered, Bergesen’s outing on Wednesday was a letdown especially after his work in Tampa Bay over the weekend. He was off badly and the Yankees just took advantage. Overall, he gave up eight runs in only 3 1/3 innings. As O's Near the Quarter-Pole, is .500 Within Reach? Here's a litte of my latest piece for MASNSports.com. Some of what you will read below is an expansion of some thoughts I had in previous entry this weekend. The question on my mind - and a lot of fans' minds - is this: Can the Orioles finish at or above .500? As we're close to the one-quarter mark of the 2011 (unofficially) season, there have been a lot of ups and downs with this team. We all know the Orioles have struggled since the end of the 1990s and this year is centered with focusing on the development of the young arms, but also to some respect - wins, losses and being competitive. 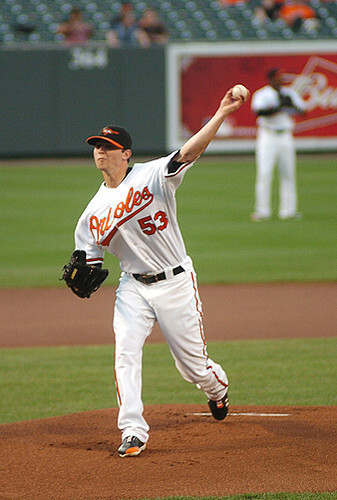 As of May 18, there is some good and bad with the 2011 rendition of the Baltimore Orioles. The starting pitching has been solid for the most part, especially with youngsters Zach Britton - perhaps the team's representative at the All-Star game in July and Rookie of the Year candidate - and Jake Arrieta leading the pack; however, Jeremy Guthrie needs to get some run support. In addition, inconsistent performances from Brad Bergesen and Chris Tillman have put them on the bubble for a spot as Brian Matusz will be back with the team soon, as well as maybe Alfredo Simon, depending on his legal issues. I figured the starting pitching would struggle at times; however, it has been remarkably consistent. The bullpen has too seen its share of ups and downs; however, the game Monday showed that they will have their struggles and at times frustrating nights. Overall, it's not been terrible, but sadly, it's not been lights-out either. Now, the offense is another story. So far, it looks like a retooled Baltimore squad has been very lackluster at the plate throughout much of the season. Right now, it looks like the new additions, plus the mainstays of the team over the past few seasons, aren't doing much at all. However, during the past week, the offense has definitely shown signs of life. Adam Jones has really started to pick it up as of late, as has Nick Markakis, plus J.J. Hardy returning to the lineup has given the team some stability at the bottom of the batting order. What a frustrating night on Wednesday . There's not much more to be said as to what happened at Camden Yards. As we all know, the Orioles lost to the New York Yankees, 4-1, in 15 innings . They are now 19-22 on the year. I went to the game last night from work and stayed there until the end of the 12th inning. Really, I would have loved to have stayed, but could not. In the end, I am glad I didn't. The game was absolutely confounding to watch as the Yankees came back to win it as Robinson Cano plated in two runs with a double, breaking a 1-1 tie off Oriole reliever Mike Gonzalez . A few minutes later, Gonzalez drilled Yankee Chris Dickerson in the helmet and was ejected. Gonzalez got a crazy, quick hook and honestly, the beaning was not intentional -- all of us Oriole fans know that Gonzalez has been wild during his tenure in Baltimore. The Orioles managed to get two runners on base in the bottom of the 15th inning; however, Brandon Snyder - who was pinch-running for Vladmir Guerrero - perhaps inadvertently killed the momentum as he got knicked in the foot while trying to run to second off Matt Wieters' drive to right field. That would have been a base hit and at least loaded the bases, plus given the Orioles a chance to come back - again. Right now, I really don't know what to think of Gonzalez. I feel bad for the guy. Hopefully, he can figure things out, but as it is, maybe he might need to be sent on his way. Last night, the man simply imploded and that cannot happen in that situation. He's just been way too inconsistent over the past two years and who knows if he can ever get his career back on track. Jeremy Accardo (2-1), who started off the frame by allowing two runners to reach base took the loss; meanwhile, Hector Noesi (1-0), in his major league debut, got the victory, going four shutout innings. Morning, everyone. 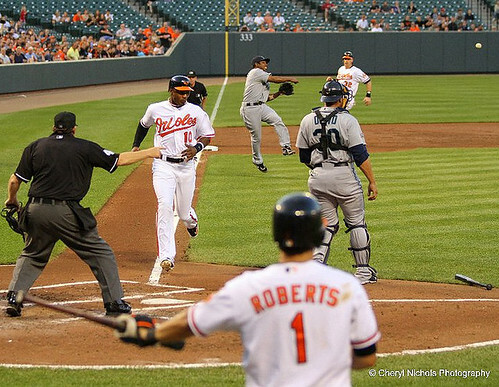 Here are photos from last night's game where the Orioles defeated the Mariners, 4-2. It was a good overall win by the Orioles after a bad stretch last week. I was not in Baltimore last night; therefore, I have to give special thanks to Cheryl Nichols for allowing me to use her photos.